George Fox, the founder of Quakerism, visited Radnorshire three times, initially in 1657, and encouraged local Quakers, notably John ap John, in their struggles. Fox’s Journal makes reference to a common in Radnorshire, possibly Penybont near the Pales, though the exact site is not known. What is clear is that Quakerism took a strong hold in Radnorshire, from very early times, despite the incredible sufferings caused by persecution. Meetings were held, in those days, in farmhouses; persecution did not permit the building of anything so public as a Meeting House. However, before long, the need for a burial ground became imperative. 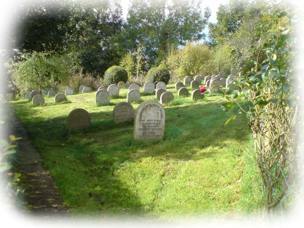 Clearly Friends (as Quakers refer to themselves) could not be buried in churchyards, yet some provision had to be made, and increasingly the need was felt for a burial ground. Here this need was met by the acquisition of a quarter of an acre of ground in the hills above Llandegley, on the 17th of 6th month, 1673, at a place soon to be known as the Pales. Leased for a thousand years from David Powell the elder and David Powell the younger, it shows that Quakerism must have been something of a force in Radnorshire at that time. In the 17th century the persecution of Quakers was severe, with swingeing fines and frequent illegal imprisonment. For example, in a dramatic event in February, 1683, a Monthly Meeting somewhere in the parish of Llandegley (probably at Pales) was interrupted by the High Sheriff. Friends were dragged out and locked up in an alehouse, whilst the Sheriff rode off to get the JP. Held overnight in bitter conditions, a number of Friends were marched over the “bleak hills” to the nearest prison, probably Presteigne, a good walk away. One of these, Edward Jones was clearly not put off by his spell in jail for in 1716 he and others became trustees at Pales of the “dwelling house with all the houses and outhouses, garden and woods growing at the lower end of the dwelling house,… with a piece part of close called Kay yr Pales”. (Cae, Welsh for enclosed field). Access to a well was guaranteed also. Clearly by now, the Pales was a substantial going concern. However, the persecution had taken its toll, and many Quakers had emigrated to America, especially the Quaker colony in Pennsylvania. The first American Meeting House was called ‘Radnor’. As a result, Quakerism in Wales became rather exclusive and inward-looking. Very few records survive of the 18th century, and by the middle of the 19th century one observer commented that the Meeting “hardly continued to exist”. But continue it did, albeit with the new impetus of Victorian evangelism, which gave Quakerism a new and unfamiliar flavour. 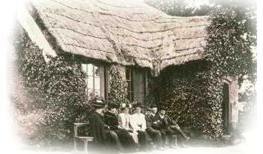 A turning point for the Pales was the decision, in 1867, to establish a school. This ran most successfully, with various teachers, until it was superseded by the availability of state education. One teacher at the Pales was the American Yardley Warner, a prominent campaigner for the rights of slaves, and it was for him and his wife Anne, that the present Wardens’ Cottage was built. There followed a zealous period, coinciding with the Welsh Revival in the early 20th century, during which three other Meeting Houses were built in tiny Radnorshire (at Llandrindod, Llanyre and Penybont). But in time numbers dwindled again, and the cottage ceased to be occupied by Friends, although Meetings for Worship continued throughout. Read more: Archive about Pales What does “Pales” mean? There has been speculation over the name “Pales”. The first deed*, of 1673, assigns it two ‘names’: “a burial ground palled Round about”, and “Y Ty ar dir yn y Swydd” (“the house on the land at the Swydd”). The deed states it is “to remain as a burial ground”. These details suggest that the ground was already, in 1673, in use as a burial ground, and furthermore that there was at least some sort of building present then. In 1694, a second deed refers to it as “one parcell of land paled or fenced in round about”. This establishes the meaning of Pales as an enclosure, and elucidates the meaning of “roundabout” in the original lease. 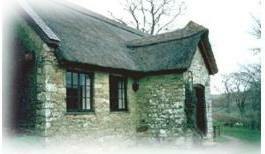 The current building is thought to have been built in or around 1717. A brief biography of John Owen Jenkins, one of the leading evangelical Quakers at the Pales. Includes his personal “dedication”. 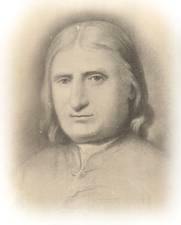 A brief article giving biographical details of John ap John, the first Welsh Quaker, plus the text (original and modernised) of his “meditation”.